You know, sometimes I just sit here and shake my head at all the stupidity there is in the world. Like the dunce and a half who screwed up the Best Picture Oscar, one of them is only half a dunce because she didn't race across the stage and rip that wrong envelope from Warren Beatty's hands. The full dunce is not going to be terminated.... right. In a few months he will quietly hand in his resignation. This is how it works. He gave CwP a black eye. Privately he's been notified, even though they may deny it, to start packing up his desk. And then there are all of the dunces in the DT White House, from Kellyanne, who sat like 13 year old white trash on a White House sofa to the Idiot in Chief, who pretty much gave a campaign speech the other night in a soft... quiet voice. They're all wearing stupid caps today, really big stupid caps, because the news broke that our racist AG was having meetings with the Russians. A lot of stupid Republicans are lining up to grab their caps, too. They would like us to be a nation of dunces. Maybe if someone sits down with DT and puts it to him in terms in might understand, like those used in a Beauty Pageant, he might understand. He needs to be told that right now we are the Number One Super Power in the World. However, Vlad desperately wants Russia to wear that crown, and for that to happen we need to lose the contest. In fact, Vlad doesn't even want us to be either the First or Second runner up. In fact, if Vlad had his way, we be disqualified; he doesn't even want us in the building. However, that's not going to happen. No one is going to have that conversation with the Idiot in Chief, and even if they did it wouldn't do any good. 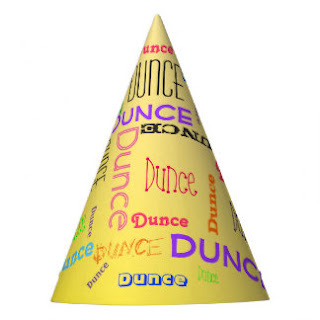 You see the Idiot in Chief's dunce cap is really, really huge, in fact it's so huge it hangs down over his eyes and ears. This is why he's the Idiot in Chief. sessions is a TRAITOR! and so are all the members of the GOPricks!